1. Heat oil in a frying pan and pan-fry nuts and seeds until toasted then add to the rice cooker insert pot. Place washed rice, sultanas, Rice Cookers recipe base and 2 cups (500ml) water into the rice cooker insert pot and stir. 3. Let stand for 10 minutes with the lid on. Stir mint leaves and cucumber through rice mixture. Serve with natural yoghurt. This entry was posted on August 20, 2010 at 8:00 am and is filed under Cooking, Family, Friends, People, Random, Recipe. You can follow any responses to this entry through the RSS 2.0 feed. You can leave a response, or trackback from your own site. And why am I not so surprised about you being a food critique?!!? hehehe .. You seem to be perfect for that!!!! Delicious … and such a stunning photograph! Looks delicious! Basmati rice is special, too. Thank you for sharing another great recipe! Double yum! 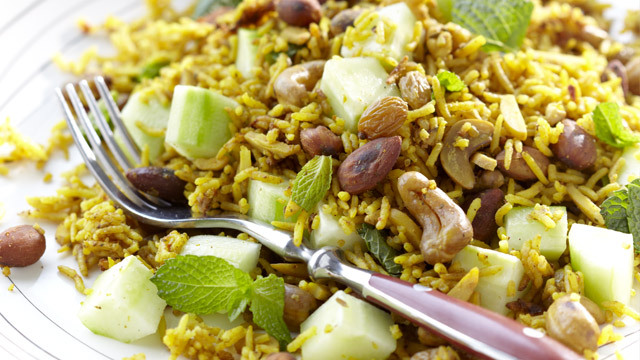 Love rice salads … satisfying! Thanks for this. Definite thumbs up.